It’s Friday – things you might have missed! Give up or get better. 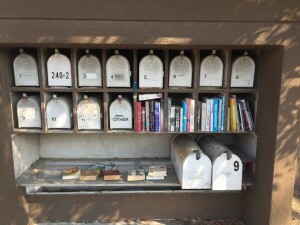 So many writers are at the horrible stage of waiting for agents and publishers to reply, dealing with rejection, looking at their work and trying to improve it and this blog post by Jo Hogan about the six years and three-and-a-half books it took her to find the right agent is inspiring. And a little bit reassuring. Grip-Lit? In the Guardian, the marvellous Sophie Hannah puts the notion that the psychological thriller is a new thing in its place. Rebecca is one of the best examples of the genre and there were many more, long before Gillian Flynn or Paula Hawkins first put finger to keyboard. The perfect bookshelf. I saw these prints at the gorgeous Collector Art Shop in Berkley, CA during our August travels and absolutely loved them. Unfortunately, we’d already spent a small fortune in there and so I didn’t buy one. Fool. 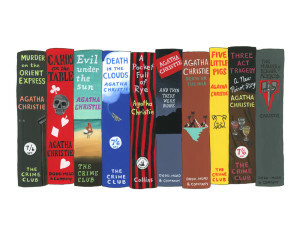 I love the Agatha Christie one and I’m hoping to find a UK stockist so that I can buy one – customs charges etc being so crippling. If anyone knows where I can buy this do let me know. It would look so good by my desk next to another couple of the prints I bought in that lovely shop. Mirabelle’s going to be on the TV! Possibly. Last week it was officially announced that Sara Sheridan‘s Mirabelle Bevan series of 1950s-set crime novels are moving to Constable & Robinson. They’ve also been optioned by STV. I’ve always thought that they were perfect material for Sunday evening drama in the vein of Endeavour and Grantchester so fingers crossed this comes off. Hous eboats in Sausalito, CA. When we were in California we made a trip to Sausalito after we’d been to Sonoma and before we drove back over the Golden Gate Bridge. It’s very much a coastal community and there are still many houseboats although they’re all a bit slick and polished now. There are some of the older houseboats left still and they’re lovely. I especially liked this micro-library next to the mail boxes. This post on the Messy Nessy blog has more information about the floating houses and the Floating Homes Association website can tell you more and when you might be able to tour some of the houseboats. 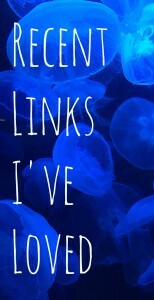 This entry was posted in Recent links I've loved and tagged Amtrak, art, houseboats, sara sheridan, Sophie Hannah, writing. Bookmark the permalink.